This top is actually 2 layers of different sized Gingham which gives a great effect & it's really soft! I was given some pre-loved clothes and when I saw this fabric I was instantly drawn to it as I have a soft spot for gingham. What I did not love was the fact that it hung like a giant shapeless sack on me. Unfortunately I didn't take a "before" photo but you can see my artistic (*ahem*) representation below. Trust me, it was not good on me... mid thigh, large and shapeless with sleeves that hit just below the elbow... eek! Ta Da! 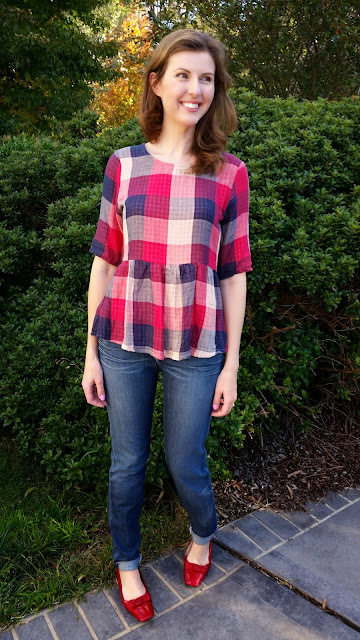 A cute Peplum Top! This is one of those great pieces that works casually with jeans or more dressed up with a pencil skirt and heels. I'm happy to answer any questions about a refashioning project you may be thinking of embarking on! Beautiful top, love the color! Thank you so much! You're also my first ever comment - so exciting! !